Profanation 2 has everything, great music, animation and lovely graphics, but no matter how many times I try, I can't get off the first screen. Why so difficult, this could have been great Thank god for Baba's Palace, now that does just about everything right. In this respect, Profanation 2 retains the spirit of its prequel. One other annoyance is that I can't bypass the scrolling message when you lose all your lives. Does anyone know if Profanation 2 has been endorsed by the authors of Abu Simbel Profanation (i.e. is it an 'official' sequel)? It's such a beautiful production in every way... except playability. The difficulty is absolutely crushing. What a pity! I was looking forward to Profanation 2 more than any other game in the comp, but the soul-destroying challenge is just too much. At the begining is hard but then you learn and get used to it, is a game for ones that like a challenge. Couldn't quite follow this as Alchimie12 demoparty was held at the exact same time this week end, with 2 Demo released that defined what will be expected from Amstrad PLUS in the future. BTW CPCretrodev is always good new and can always provide nice new productions and interesting surprises right before Xmas. Also quality level seems to step up each year. Can't wait to watch the awards giving ceremony replays if available somewhere. And can't wait to test the top games from this year. Great work by all. Will be giving all these a thourough testing and along with other games this year, will be in my top 11 CPC games of 2017. Here's a type-in listing for you. You may need to change the filename in line 20, depending on where you downloaded the game from. 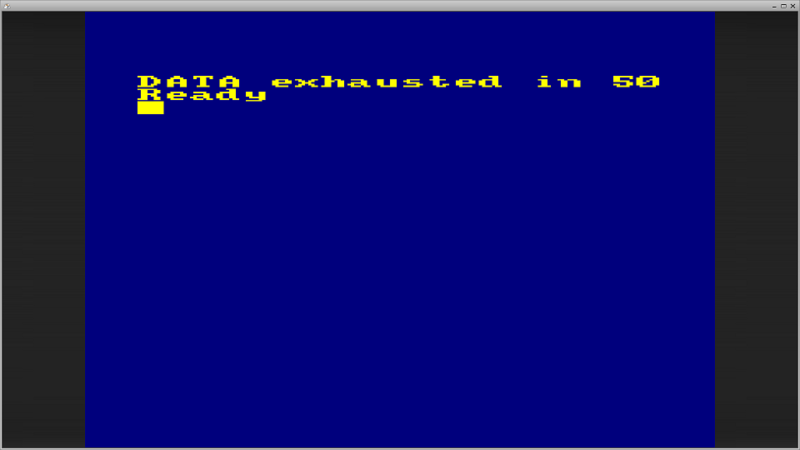 Reading BASIC code above, "Data exhausted" probably means a typo when typing the program in the CPC. Have you double-checked it? On my browser, the last line of the program (line 140) is hidden in the area that displays the code. Maybe that's the cause of the error? Really loving Cris, odd prelude, got to chapter six, but it says I need the book, tried everything, but it's too high to reach, help? I really liked the presentation of Cris odd prelude, but the gameplay needs some serious tweaking imo. But yeah, it's a good first step, I can't wait to see the finished product. I thought it was finished, you mean there's more to come? It's a really cool game that works in the constraints of a competition. I believe without the deadline and artificial limitations, along with more feedback from the community, it has the potential to become awesome. You can't get it at the start, you have to go back for it. Yep, you have to go back to take it. It will be reachable. But... if you die in your way back to the first screen, you'll have to start from the beginning of chapter 6. Hahaha! Thank you very much! It's amazing reading that impressions. We are working hard on the extended game. As I said before, more animations, much more scenes, chapters and puzzles, much more bad and good boys... And of course some surprises we want to keep for ourselves until they are ready to be shown. Keep in touch in @dreamin_bits twitter account! We hope you play, we hope you have fun, and we hope you finish the game!! The platforming needs fixing imo. Especially the ledge-grabbing mechanism. Currently, the character grabs a ledge only if up is pressed on the controller. Ledges should be grabbed automatically, and either have her hanging or pulled up automatically also. Plenty of time I went for a jump, expected a grab (so kept UP pressed) only to land on my feet and immediately bounce into the next pit. The platform needs to be better defined too: sometimes I didn't press UP because I expected to land on one, only to clip through it to my death. Pressing UP to grab the ledge at the same spot made it right. There are a couple of gaps near the end that require a pixel perfect jump. You may want to rethink that. It may feel better simply with a more accurate ledge-grabbing mechanism and no more clipping through earlier platforms. The rain chapter. I really like the idea, and visuals, but having only a couple of droplets on the screen made it feel more like a leak from an unseen pipe than rain. Also it made extremely difficult to understand where the platforms are and where do they end. If I may suggest, a diagonal rain not unlike in Fres Fighter II Turbo. And in addition to that, a soaked invisible platform that continuously leak regular sprite droplets. Having two kind of droplets, one regular that "seep through" the invisible platform, and one that hangs on and drop from the invisible ledge, with a different shape. In itself, the game as it is currently, works. It takes only a few retries to understand the "unintuitive logic" and overcome it. But it's the player working against the game, not with it to enjoy the story you want to tell. I don't want the game to become easier, or too easy, but the difficulty should be more organic, more logical. One last thing. I don't know how feasible it is, or if you already planned it, or if there are technical constraints that prevent it (like memory limitations or something). But longer chapters would be welcomed. Simply having more of the thematic traps would help with the idea of progression through the story, overcoming a chapter would bear more weight. Maybe with more checkpoints depending on how you feel about the difficulty. And now, without anyone asking for it, here is my review of ALL the games. But first, my top 10 ! Excellent game! I love the concept, quite new on CPC. The graphics are great, especially the introduction fullscreen, which is magnificient. I'm sorry, I don't want to be controversial, but this game deserves a much, much, higher place in the official rankings. It's a full playable, original, beautiful, fun game to play. It deserves more praise than many of the other games... Did the jury even try to understand how to play it? Anyway, just my opinion. Very nice. The gameplay is really good, the graphics gorgeous, the music is good too. I put it at second and not at first because the concept was "borrowed". Ahh, an Asphalt Reloaded! Really liked it (as well as the music). It's as good as the original, even a bit more playable! Congrats. Very nice game! The gameplay is very good, the inertia makes the game special. I also like the fact that times is an important factor: bricks do not disappear immediately. Very interesting! Too bad the collision were a bit awkward... But it is truly a game to experience. I got stuck in the 6th chapter... I hope the authers will make another game! Very nice game! A bit cryptic at first, but once you understand how it works, it's great. Of course, a better design is lacking, but it's enjoyable nonetheless. I really liked the intro image! I think the gameplay is a bit problematic on this one. It's very hard not to lose once you have the ball, it's very hard to win if the opponent has it... Maybe it's funny with two players? I found this game quite charming. Even if it feels a bit buggy, I think the coders took really care of about a lot of things, such as the nice music, the possibility to shoot in all directions. Nice little shoot, running at 50hz. Nice little song (a bit short!). Too bad after level 5, nothing new happens. A little bug, run"loader" doesn't work (memory full). The binary must be run directly. Nice Portal remake, but quite hard to control, making it difficult to enjoy... I suspect playing with keyboard triggered bad combination, selecting the wrong portal. The developer should have tried it on a real CPC! Well... Not much fun, but at least it runs at 50hz, and there is an original music! Not bad for a first try (I assume it is). Well... Rather unplayable. Is there a way to start the game again after dying?? Well... Everyone has to start somewhere . Actually, more playable than I thought at first. But not much to say else. Not bad actually. But too simplistic for not-children players. Probably not bad for a first try, but not enjoyable. An OK music. Quite ok for a first try. 50hz, but very buggy. Not very good as well. Not so bad! Minimalist design, but the gameplay is actually enjoyable for 10 minutes. Couldn't beat the second guy. Not good at all. I keep on shooting the little robot, nothing happens. No other room to explore. Too bad, the music was nice. The idea is good, but the implementation not so. The graphics are very bad, plus with the randomness of the levels, it's sometimes very hard to understand what is going on. My character ate all the background because of a bug, I can't leave the room because of a snake... Well. Ok for a first game. The music is nice. Playable (I like the bat animation), but very hard to survive. I beat one (cool) boss, but then died. Couldn't skip the Game Over page to play again, had to reset (!). Not very good, why does the character can only shoot in one direction? This artifically increase the game difficulty, and makes it not fun. I share your opinion, Phantis Legacy is impressive, not hard to understand but it requires some effort to start playing with it (maybe a tutorial level could help to start). And when juree have 29 games to test in one week they can't spend too many time on one game i guess. In any case i have a lot of fun to play with Phantis Legacy i have reach 4th level for now. What bothers me is that devs will not apply to the RetroDev anymore if they feel their production doesn't deserve the credits it should. They will either not make games any more, or publish the game outside Retrodev where it will receive more attention. I truly love the RetroDev initiative, but there is a trap I'm afraid they've fallen into! Recognition is the key, I guess. Speaking for myself, if I make a super game I'm hugely proud of, submit it to Retrodev, and am being beaten by games of lesser quality (in my opinion), I will be disappointed and I may not participate the next year. I do not speak for anyone else, of course. Page created in 0.309 seconds with 104 queries.